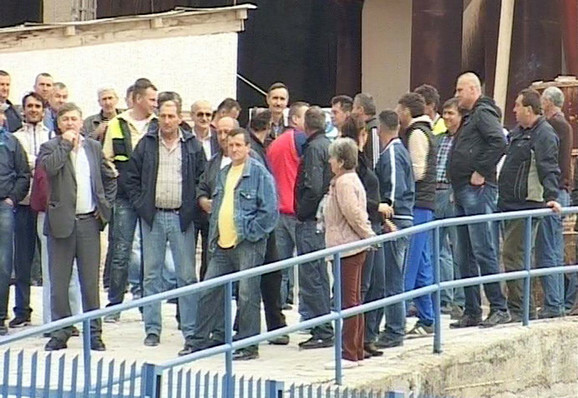 After two privatizations, massive layoffs and two worker strikes in less than a decade, the quarry and lime plant “Ravnaja AD” bears testament to the class struggle in Serbia, serving as a vivid example to the dictatorship of capital over the lives of workers who toil for their bare existence in the country. In the winter of 2017 a picture of a woman throwing a large boulder appeared in the daily paper Danas. 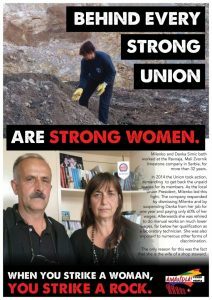 With her back bent over, Danka Simić was performing her daily work as a “cleaning lady,” but instead of cleaning halls and toilets she was sent to the stone quarry of the company she works for, “Ravnaja AD” to do what can only be described as penal labor. Since the first privatization of 2007 by a foreign investor, and the termination of the privatization contract by the state three years later, the number of workers in Ravnaja quarry has dwindled from around 350 to 125. By the time the company was sold for the second time in 2011, the quarry complex in Mali Zvornik had accumulated €2-million in debt. Milenko Simić, a worker and Danka’s husband, says these debts were accumulated due to shady business practices that involved selling enterprise materials at a price lower than their market value to companies in the ownership of the same conglomerate, as well as a result of tax evasion. “They even transferred the ownership of the machinery to Ratko Mitrović,” Milenko remarks. “Ratko Mitrović- Niskogradnja” is just one of many companies in the privately owned construction conglomerate “MBA Miljković,” which consists of four concrete plants, factories for construction materials, quarries, warehouses, workshops, and heavy machinery. The company that receives state grants for major projects in infrastructure has become infamous for exploiting its workforce. Last summer, during reconstruction works in the center of Belgrade, its workers went on strike, stopping work on a number of occasions in the following months due to unpaid salaries, as well as unpaid social and health insurance contributions. “MBA Miljković” bought a large share in “AD Ravnaja” in 2011, when 70 percent of the company’s assets were sold-off at a price of €800,000. The privatization contract for “AD Ravnaja” obliged the new owners to maintain production in the following five years. In spite of these contractual guarantees, production kept on plummeting, together with the size of the workforce, which — at the beginning of 2018 — numbered only around 50 workers. The rest got sacked. “You spend your whole life in a company, 35 years I spent building it, my wife has bee her 31 years, and they ruin it in a decade,” Milenko remarks. “The management asked many of my colleagues to sign their resignations. This was an attempt by the company to avoid giving severance pay to redundant workers. Many refused, but around 30-40 agreed, not knowing what their rights entitle them to. Some of those who refused were declared unfit for work and were sent away in the end. Those who stayed have all been classified as auxiliary workers,” Milenko continues. 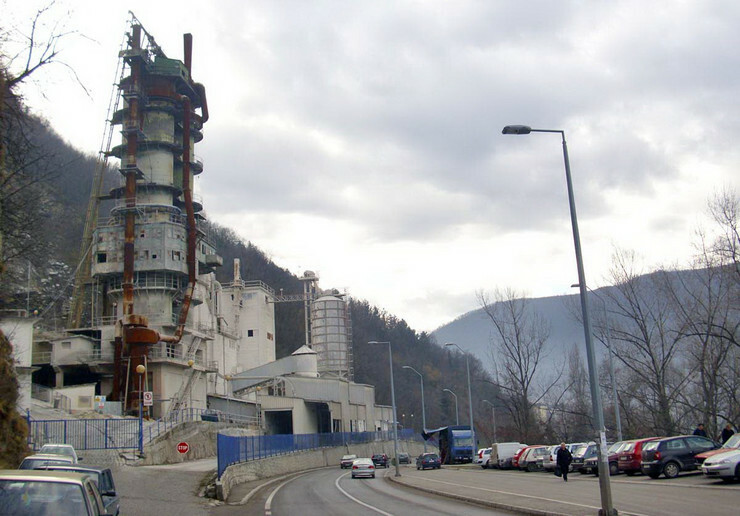 After the 2011 privatization the bank account of the quarry was blocked by the Central Bank due to its accumulated debts, resulting in production cutbacks and the closing of the lime-plant – one of the biggest of its kind in ex-Yugoslavia. “Before the privatization, we had €2-million on our account, now we are in debt.” Milenko remarks. As payments of wages and pension contributions started running late, the workers refused to “mind their own work” and turn a blind eye to the plundering of their livelihoods. After four and a half months of work with no salary they fought back and organized a general strike in March 2014. Milenko, standing out as the chair of the strike board, was a fervent advocate for his fellow workers, who demanded that their old salaries and pension contributions be paid and the blockade of their bank account be lifted so that the plant could once again begin working without occasional electricity and fuel shortages. The strike lasted for seven days, after which time the workers received their pension contributions and three months’ worth of pay, with the rest following shortly afterwards. It was a triumph for the 109 colleagues who stood in solidarity with each other, but the real troubles for the Simić couple were just beginning. In the months after their successful strike, Milenko’s wife Danka was sent home on temporary leave (“waiting period”), which could, by law, last up to 90 days. In Danka’s case it dragged on until September 2015. In the meantime her position as lab technician was filled by another worker. When Danka was finally summoned to the director’s office she was notified that she was being sent to ‘Ratko Mitrović’ where she continued to work. She eventually returned to work at Ravnaja in March 2017, but was once again called-in to the director’s office and told to sign a contract as a “cleaning lady,” continuing to work for a wage lower than the legally defined minimum. Her position as a cleaning lady in a quarry didn’t only involve dusting halls and cleaning toilets, she was also given a shovel and required to move debris. “I think she is the only woman is Serbia that does this kind of work,” noted Milenko. Being moved from the laboratory to the factory floor wasn’t enough of a punishment – on a number of occasions she received a lower salary than her contracted amount. After one payday she went to the director’s office to file a complaint. In that instance she was met with what Milenko describes as mental torture. “She was frowned upon and told by the director and the director-technician that her count was wrong.” She collapsed sick and was taken to the hospital. “Before all this happened they tried to lay her off and send her off without severance pay like many other workers before her. She refused and was told that she would regret it,” Milenko describes. Danka’s trip to the hospital was the last straw for Milenko, who called the director and told him he will do what he must to protect his family. The director in turn seized this opportunity to phone the police and Milenko got sacked for his “disrespect of work discipline”. He was after all the one ready to lead the struggle in 2014, and in doing so became a suitable candidate for punishment by the management. Making an example out of the mutineer would – they hoped – not only break his spirit, but also dissuade his colleagues from ever trying to strike again. His name and the name of his wife Danka symbolize the fates of those that dare raise their voices against a decade-long process of privatization that brought their once thriving quarry to a standstill. Following Milenko’s sacking, the management tried to isolate the workers from Milenko, who filled a lawsuit against the director, Aleksandar Savanović, and issued a working complaint to the Inspection of Labor on his and his wife’s behalf. In the meantime, Danka was put to work in the quarry, picking up stones by hand, cleaning them and relocating them to another location – work that is usually done by machines. “There is a constant danger of rocks falling on her head,” Milenko complains. At first, she worked alone but then a colleague who, as Milenko says – “refused to sign his resignation and go to the employment service,” joined her in this drudgery. After the story had surfaced in Danas she was sent back to the factory, but after a short while she again found herself at the quarry, cleaning and moving the debris. In the meantime discrimination continued on other levels as well. ”The director even locks the women’s locker-room before the end of the shift so she has to undress in the men’s department,” Milenko said. On 30 March 2018, the Commissioner for the Protection of Equality sent a recommendation to the company asking for the removal of discriminatory practices against Danka. A message of solidarity also arrived from the office of the BWI (Building and Wood Workers’ International). Despite all these efforts, and after years of workplace discrimination Danka was finally sacked on the 8 June 2018 as a ‘redundant’ worker. Milenko’s first complaint was refused by the Labor Inspectorate, after which he filled an appeal to the Ministry of Labor, Employment, Veteran Affairs, and Social Policy and was returned to work on 13 February 2018. What was to be his first day at work became another disappointment when he was handed new resignation papers upon his arrival, restarting the whole process over again. The new complaint Milenko filled was yet again turned down by the inspector and now he has no choice but to file a new appeal to the Ministry. While waiting for the labor dispute to be finally settled Milenko stayed on as head of the union and continued to organize the workers in 2017, who again struck in March and in June of that year when the management decided to pay what they were owed. “They would never pay us unless we demanded it. That is the sad truth. Even now they owe the workers the last four months’ worth of pay.” Milenko finishes. He is determined to continue his struggle for his labor rights, the rights of his colleagues, and for the future of the quarry upon which their livelihoods depend. Milenko and his co-combatants wage an often desperate struggle for their livelihoods, in which the working men and women have to this day failed to establish a united front and turn the tide against their exploiters. Milenko’s story is just one example of many militant workers who had shown initiative and courage to participate in this larger struggle. Neither lack of knowledge nor will, nor a vast territory, separate Milenko and his co-combatants from waging it successfully on a national level. Rather, it is the lack of organization that can give individual and atomized economic struggles a more lasting character. One that would tie together economic demands of individual groups of toilers with the political means for achieving them. Two of the largest national workers’ unions have time and again demonstrated their inability to lead such efforts. Their leaders remain silent on issues such as the new Law on Strikes and the latest examples of abuse in the textile industry. By openly endorsing the Minister of Labor at the May Day event in Belgrade, they have hammered the last nail in their own coffins. The workers now have the task of reclaiming their associations from the hands of opportunists and careerists, while searching for new political allies on the left that will provide them with ideological and organizational assistance. Only through this alliance and consolidation will the working masses attain their class dimension; only then will sporadic outbursts of hope and despair be harnessed into a concentrated push for reforms that will relieve the workers from their daily struggles for bread. “Small victories” will provide them with enough experience, confidence, and strength to realize their historic mission in the future and put an end to exploitation altogether. Nemanja Pantović is a student of political science in Belgrade. He is an active member in the youth-workers collective “7 zahteva,” the Student Movement of Novi Sad, and editor of “Studentska Zona” – the movement’s newspaper.